A celebrated harpist and Oklahoma native returns for a concert, a museum draws from its film collection in celebration, and the University of Oklahoma hosts an evening of international culture. Acclaimed harpist and Oklahoma native Yolanda Kondanassis makes her return to the state with a Sunday night performance in Edmond. 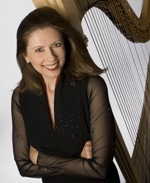 Yolanda Kondanassis performed with the New York Philharmonic at the young age of 18 and is considered today’s most recorded classical harpist. In addition to performing, Kondanassis is an author and environmentalist. She is the founder and director of the environmental and arts organization Earth at Heart. Flutist Eugenia Zukerman joins Kondanassis for the performance and is an expert in her craft as well. Eugenia Zukerman studied at The Juilliard School and has been an arts correspondent for CBS’s Sunday Morning since 1981. These multi-talented women combine their expertise for a concert at the Armstrong Auditorium on April 15th. Film noir fans live for the drama, stylization, and mystery that characterize the genre from the 1940s and 50s. The Oklahoma City Museum of Art aims to satisfy the need to see a few of these films on the big screen during Film Preservation Festival 8 from April 12th through the 18th. For this one week, the museum shows 35mm and 16mm prints of movies such as Orson Welles’ Touch of Evil, Sunset Boulevard, and The Maltese Falcon starring Humphrey Bogart. These screenings are in celebration of the 10th anniversary of the OKCMOA’s Noble Theatre, and its growing film collection. Every spring the University of Oklahoma’s International Advisory Committee coordinates a celebration of culture and diversity. In its 42nd year, Eve of Nations allows international students the opportunity to showcase their heritages. The evening consists of an international dinner, fashion show, and cultural dance competition. This year’s theme is “Branching Out.” Performance groups prepare for weeks for this one night only event, and the dinner menu is specially crafted to incorporate as many different cultures as possible. Seventeen of the university’s International Student Organizations perform at The Lloyd Noble Center in Norman on April 13th. President’s Arts Week begins April 12th at the University of Oklahoma with a wide variety of artistic displays lasting through the 22nd of this month. Documentary producer Ken Burns visits the Oklahoma History Center on April 13th and discusses his new work about the Dust Bowl. For more information and complete schedules, visit our calendar page.